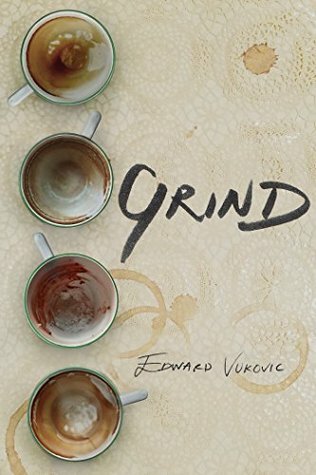 This book is told from a variety of view points and as they are introduced, the characters swirl through the plot like the steam and scent of coffee in eddies of breezes, mingling and changing as they meet. Just as if you were to follow your nose walking through your favorite local coffee shop, the scent of some of the characters drew me in. I wanted to know more about the woman who reads the future in coffee cups and I drank those stories up looking for seconds. Others pushed me back, the real estate agent was not what I hoped for, nor what I was expecting. Yet others, like the homeless man, changed on closer inspection, the difference between the initial scent of a cup and the surprising flavor on the tongue. And I think the cover is wonderful. Judge books by covers sometimes- it totally works! These people living in an Australian city have nothing but coffee in common, until they all drift toward the ceiling, swirling, changing and intersecting. Once that happens, once all the characters intersect, some in big ways some smaller you are left with an overall ambiance that is better than any of them individually. Would I recommend it? Yes and I don’t even drink coffee.